The Good: A quick and easy way to turn your barnacle-ridden USB drive into a young and fresh network-attached storage device-something no good home should be without. The Bad: Why not just put that money toward one of the many, many routers that already have a USB input to begin with? Many of them aren't much more than $79, and definitely not much more than $99, which is the PogoPlug's price without the introductory discount. You'll see talk of an open API below, but since when do USB dongles need to rely on developers to make them worth the price? Still, if cost-benefit works out in your setup's favor, turning any USB disk into a network share for $80 isn't bad. Consumer Electronics Show, Las Vegas, Nev. and San Francisco, Calif. – January 8, 2009 – Cloud Engines today unveiled the Pogoplug, a small device that connects external hard drives to the Internet, making personal files instantly shareable and accessible. Pogoplug enhances the mobile lifestyle by providing seamless access to digital content from any computer or mobile device around the globe. 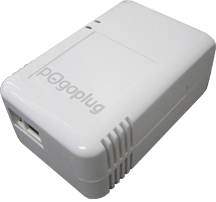 - Easy Installation – The Pogoplug connects directly to any home network and requires no special technical knowledge to setup firewalls or other configurations. - Full Web Access – All the files from an external drive can be viewed or downloaded through any Web browser, with no need to download or install extra software. - Access Your Data Anywhere – As long as you have an Internet connection, access your files with Windows Explorer or Mac Finder while the drive stays safely at your home. - iPhone Application – Access all your media from an iPhone, and even send new pictures from your iPhone straight to your home with a single click. - Safe and Simple Sharing – Easily share personal content, including video and photos, with friends and family with no uploading. No software download or registration is required by recipients. - Open API – Pogoplug is expandable over the Web. Developers can use our open Web services interface to build new features. Soon, Pogoplug will connect directly to popular sites that offer backup, file synchronization, photo printing and more.